In this photo provided by Normandy Studios, Pfc. Stephen C. Benish, of Clark, N.J., is seen in a 2002 yearbook photo from Arthur J. Johnson High School. 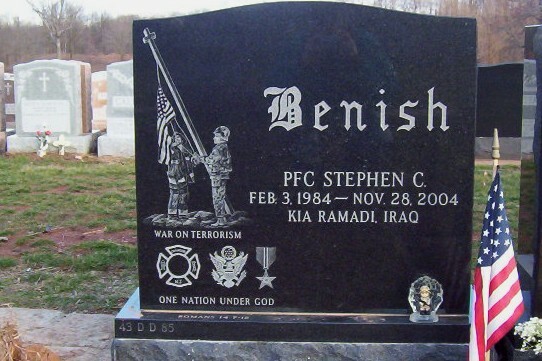 ​Hometown: Clark, New Jersey, U.S.
Died: November 28, 2004 in Operation Iraqi Freedom. Unit: Army, 1st Battalion, 503rd Infantry Regiment, 2nd Brigade Combat Team, 2nd Infantry Division, Camp Howze, South Korea. Pfc. Stephen C. Benish of Clark, NJ was a 2002 graduate of Arthur L. Johnson High School and received a certificate in electrical technology from the Union County Vocational School in Scotch Plains. Stephen was raised in both Linden and Clark. Before joining the Army, he was employed by Network Electric in Clark. The handsome, blond haired, 6 and a half foot tall former boy scout joined the Army in 2002 because he wanted to serve his country. He was happy being part of a fine group of men and women. 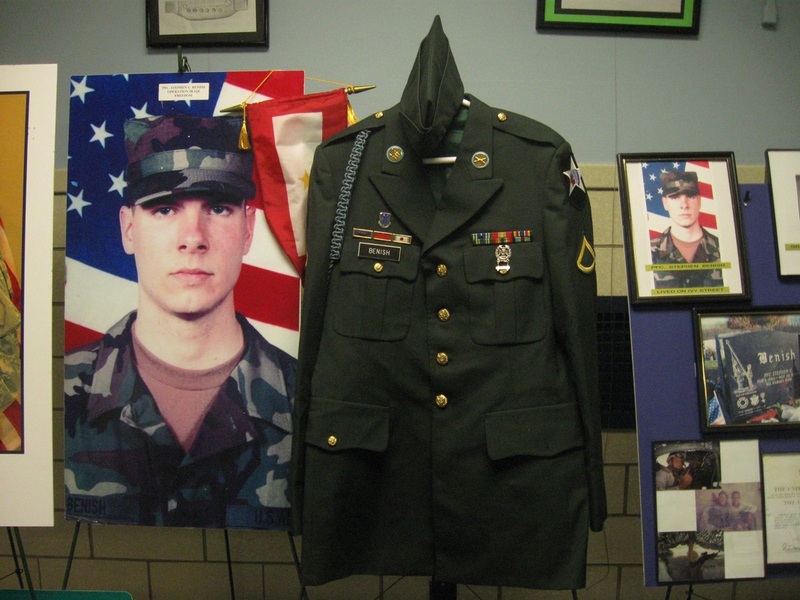 Steve believed that, if not for fighting on Iraqi soil, the fighting would be on American soil. He hoped his four years in the Army would help in the future when he planned to apply to be a paid firefighter in the Cranford Fire Department, where he had served as a fire explorer since he was 12 years old becoming a volunteer with the Department when he turned 18. He had many mentors in the fire department and was in his glory to be part of the camaraderie. He saw their hearts broken from all the firefighters lost in the terrorist attacks at the World Trade Center. His medals and decorations include the National Defense Service Medal, The Global War on Terrorism Service Medal, the Global War on Terrorism Expeditionary Medal and the Army Service Ribbon. 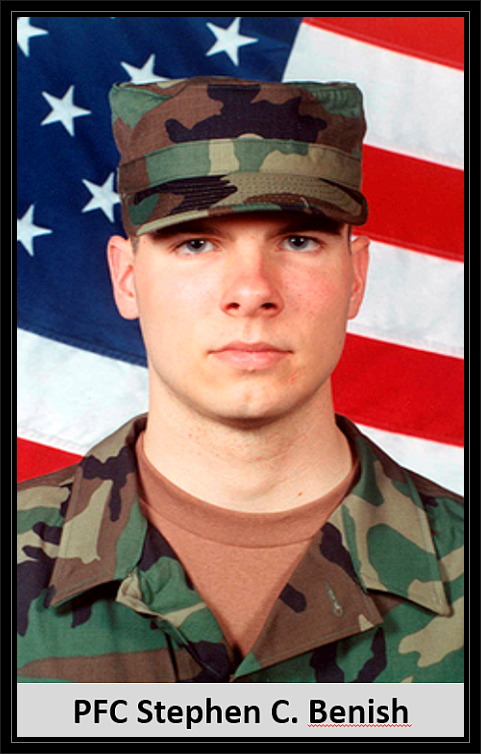 The young man who spent most of his life in uniform, from Boy Scout to Explorer to volunteer firefighter, was killed by enemy fire while on foot patrol in Ramadi, Iraq at age 20. When Stephen C. Benish went to Iraq, his mentors at a local fire department took up a collection to ship him necessities such as toilet paper, soap, shampoo _ and cigars. "Being out in the field and not having any luxuries was tough," said Cranford, N.J., Fire Chief Leonard Dolan. "He was looking forward to getting out and coming back and being able to tell us about all of his adventures." Benish, 20, of Clark, N.J., died Nov. 28 in hostile fire while on a foot patrol. He was stationed at Camp Howze, Korea. Benish was inspired to join the service by his mentors in the fire department after the Sept. 11 attacks, his mother said. In high school, the 6-foot-7 Benish wrestled and studied electrical engineering through a county program. His senior-year English teacher, Kurt Epps, said Benish "always had a smile on his face and he never let things get him down for too long." He is survived by his parents, Candy and Stephen J. Benish.